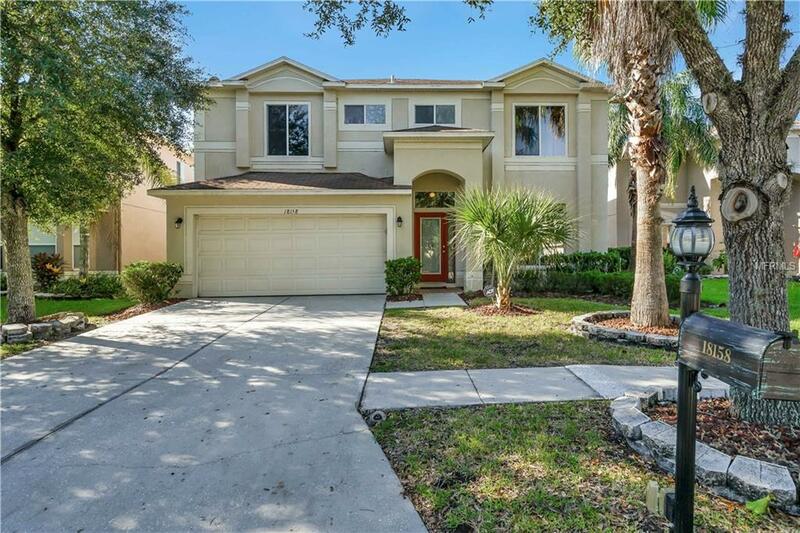 Beautiful 3 bedroom, pool home with water and golf course view. Large kitchen with wood cabinets, granite counter tops and dark stainless appliances (new 2017). Living room and Dining room with faux painted walls and laminate flooring. Family room with electric fireplace and laminate flooring. Large loft with view of water and golf course. Large master suite on the upper floor with view of water and golf course, walk in closet, garden tub, walk in shower and his/her sinks. Two good size guest bedrooms on the upper level with laminate flooring and large closets. Laundry closet on second floor (washer and dryer do not convey). Guest bath on upper floor with tub/shower. Ceiling fans in all bedrooms. Large, screened pool deck with heated pool and in ground spa. Rear view offers partial conservation as well as a view of the pond and golf course. Community offers golf membership (additional fee), access to resort style pool with kid splash zone and water slides, restaurant/lounge, fitness center, volley ball, tennis, basket ball, park and playground. Very low HOA fees. CDD included in taxes. Two pet max per home. Tampa is home to theme parks, zoo, airport, cruise port, nightlife, excellent shopping, dining and sports teams. Close to Hardrock Casino, approx 30 min to Clearwater Beach, approx 90 min to Orlando theme parks. (Photos taken before family room/kitchen were painted a lighter color). Additional Lease Restrictions Please Consult Condominium Associates To Verify Rules On Leasing. Please Confirm Minimum Lease Period With Condominium Associates. Must Own 1 Year Before Leasing. All Tenants Must Be Approved Before Moving in. Listing provided courtesy of Best Of The Gulf Realty Inc.